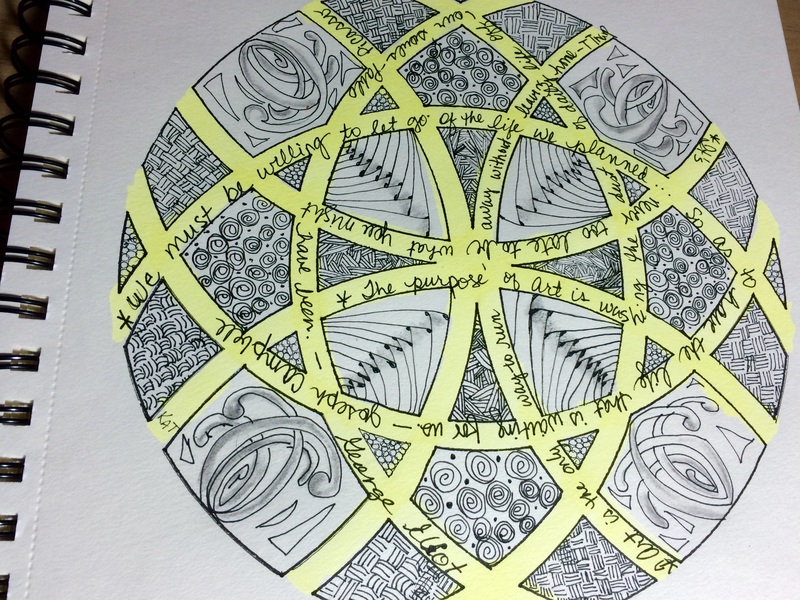 Posted on March 1, 2015 by Kat, aka "ArtyKat"
I can’t tell you how surprised – and Pleased– I am to have so many followers! I thought only 5-6 were following and then the stats say that over 280 are following! Could’ve knocked me over with a feather, and that’s saying something! I used to live and work professionally in the city of Houston, Texas. It was the 4th largest city in the United States of America and 4 million strong. I led a fast-paced life as I worked as a psychotherapist with several agencies, had a private practice (but was non-profit) and had four dependant on me at home. I now live the complete opposite life in Appalachia, in a county of 4 THOUSAND, and have no dependants, and live with my wonderful, retired (and disabled, like me) English husband. Our lives have little stress compared to before, and the town is much like Mayberry. In fact, the real Mayberry is not too far away! 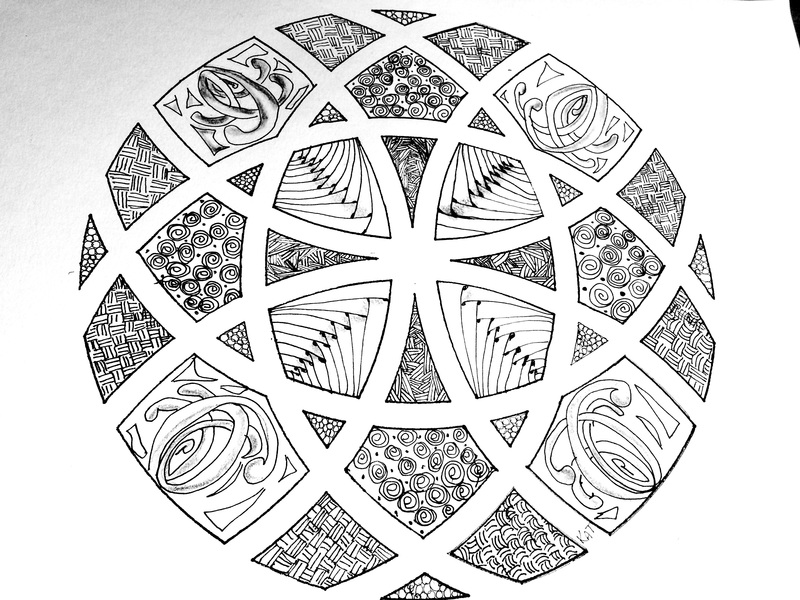 I wish so much that I had discovered Zentangle when it first came out! I would have loved to have experienced the reduced stress, the increased focus and concentration, and flow of creativity back years ago when I worked in a state prison! But back to now… I love the time I spend with my photography and art. When my husband had open heart surgery this year (bypasss), I sat alone in a distant city in a waiting room, just waiting to hear if he made it through the surgery that we didn’t know he was having the day before! 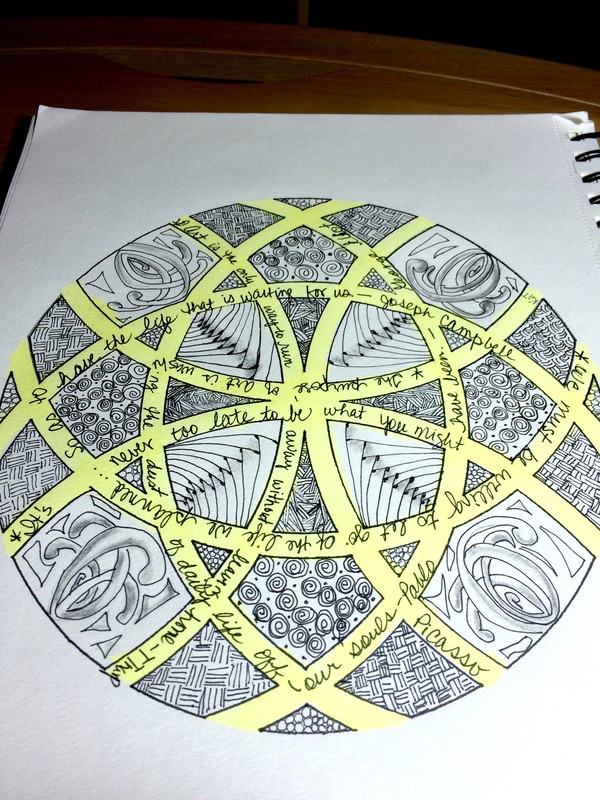 The ONLY THING that got me through besides my faith was working on a ZIA heart (Zentangle Inspired Art). I was thankful I’d brought paper and pen with me! 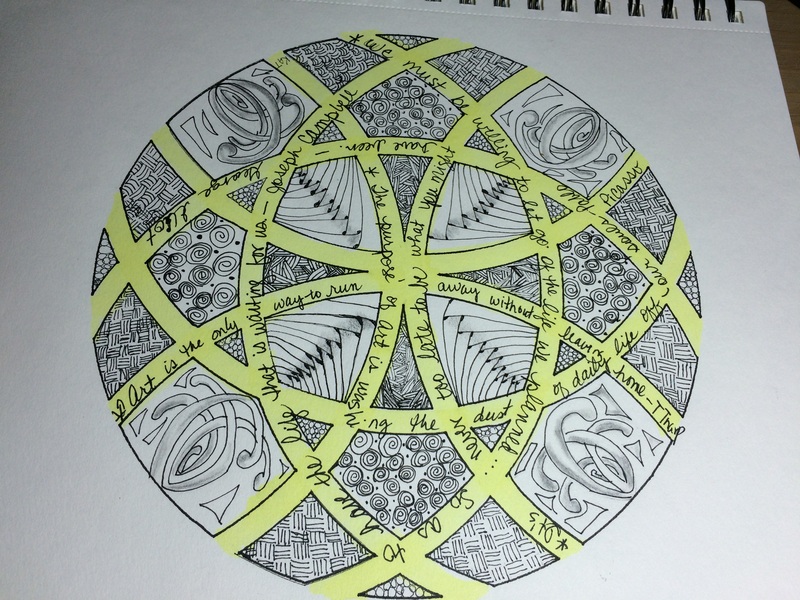 Here is what I’ve been working on …Click on photos to enlarge. 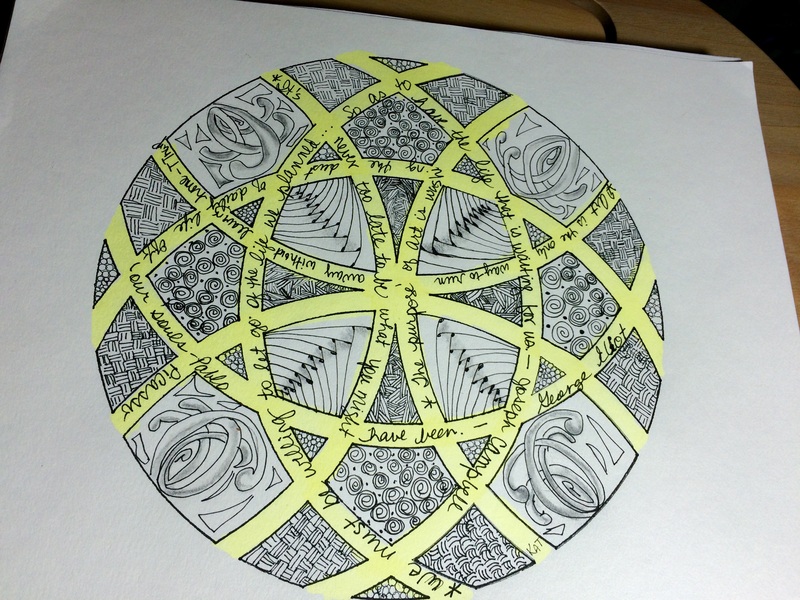 This is what it looked like when the mandala (or Zendala) was done. 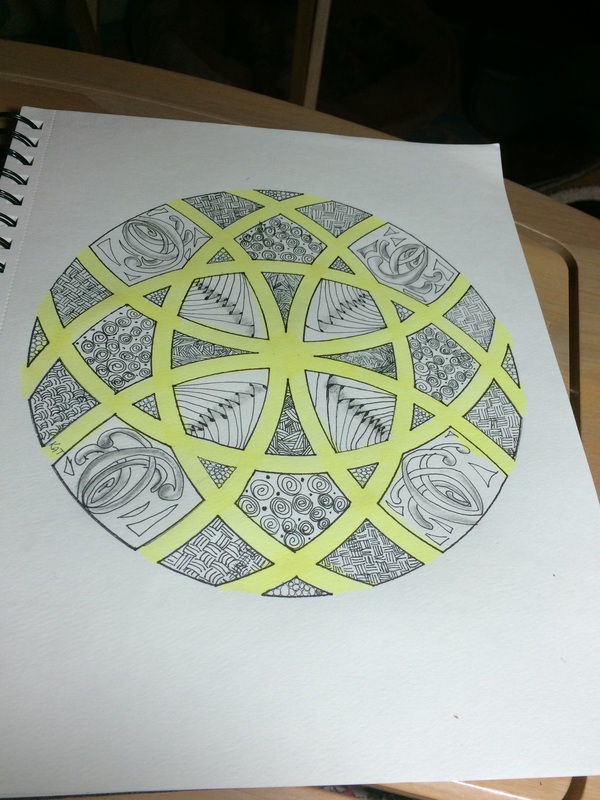 Yellow added to the Mandala, using a Copic pen. Super cool Kat and congrats on your followers! I love this design! I love how you use colors in your work. This is so pretty!